It feels like a lifetime and a half away when I first learnt to float through inner space, blowing my virgin bubbles and marvelling at creatures I had only met before in books, on the tele or through a cheap, steamed-up mask on a childhood snorkelling adventure in Cornwall, south west England. The PADI Course Director Training Course, for those who are yet (or un-inclined) to learn the intricacies of the PADI Professional ladder and how to climb it, is held twice a year to put top level PADI Master Instructors through their paces in a number of ways, both above and below the water’s surface. 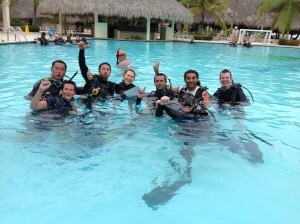 The end result being – if all goes according to plan – that the candidates are able to travel back to the many various corners of the globe from whence they came to begin training PADI Instructors themselves. Of course getting there in the first place was no mean feat. To be able to get your first little toe in the door, i.e. getting the nod from the PADI Powers to begin preparing your application, took a fair few years of certifying hundreds of divers of all levels, organising Project AWARE activities, devising marketing and business plans, having some (ahem) modicum of success running a PADI 5 Star Instructor Development dive centre… and of course helping to train the future generation of PADI dive instructors. Once through the interview process, it was time to pack the kit bag and head off to join my 40 fellow would-be Course Directors in the white sand/turquoise sea paradise of Punta Cana, Dominican Republic. Making up an impressive 22 different nationalities and speaking more than a handful of disparate languages, the array of talent was drawn in from across Europe and from countries as far away as South Korea, Japan, Chile, Russia and America to name but a few. Among us was also the Ukraine’s first ever Course Director candidate! 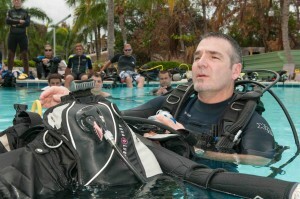 Thankfully the old adage is true: Scuba diving does, indeed, unite us all. Under the sea we speak the same idiom: the mother tongue of the subaquatic world. 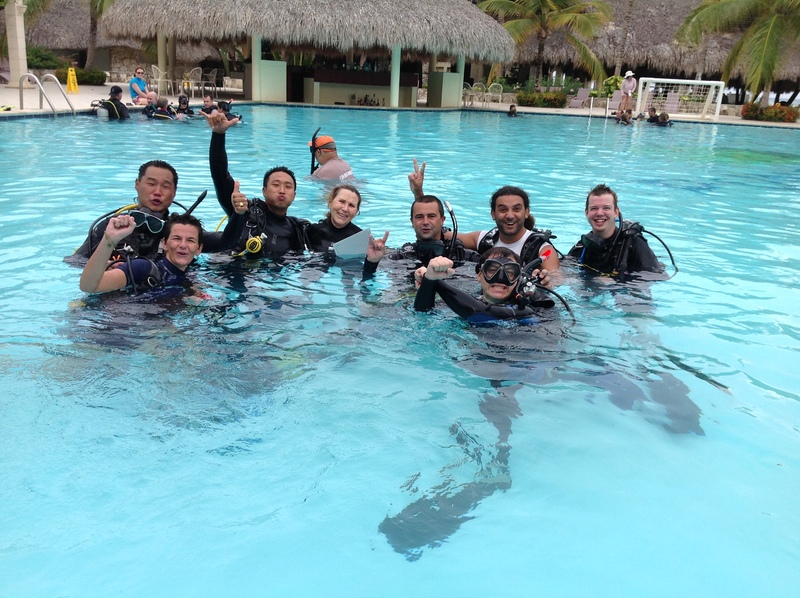 So with instant bonds secured, the new groups of lifelong friends settled quickly into the course proper and before long we were all well on our way to being educated in The Way of the PADI CD. Under the vigilant gaze of PADI Vice President James Morgan and his team of Staff from the various global PADI offices, we got to fine tune our presentation skills, be lectured in inspiring fresh marketing ideas, practice evaluating “PADI Instructors” in the water, demonstrate our own mastery of in-water dexterity and take part in workshops on everything from business and customer service to social media and website design. Eight full formidable days later and in a bit of mental haze, I was accepting my certificate and new weighty title of PADI Course Director. 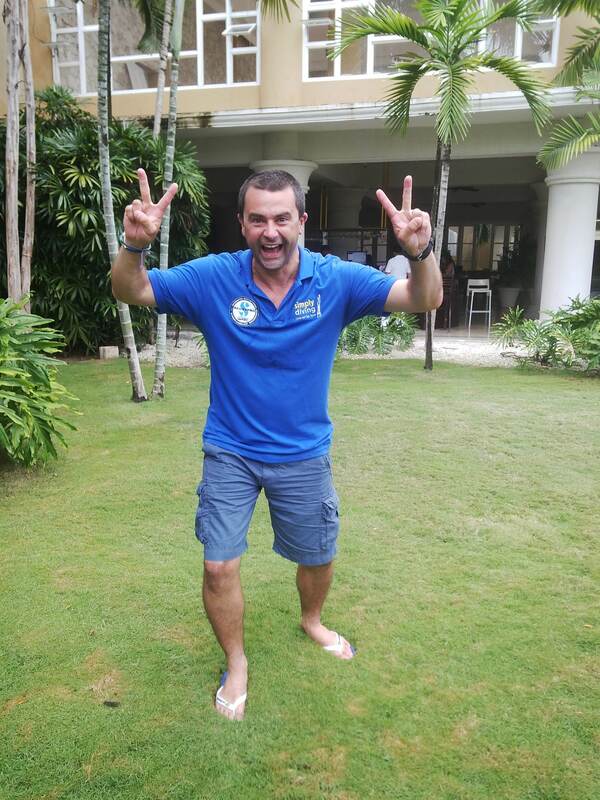 Me, just after hearing that I was now a brand new PADI Course Director! And so now back on the Costa del Sol, as the area’s only resident PADI Course Director, it’s on to the next phase of the journey and my first PADI IDCs (Instructor Development Courses), in which I try and encourage others on their onward path of achievement. The PADI Course Director Training Course taught me that this won’t always be a stroll in the park, but it will definitely be rewarding. PADI President Drew Richardson adds: “I would like to personally congratulate Simon for completing the Course Director Training Course recently in the Dominican Republic.